I don’t know about you but during the week when it comes to cooking dinner I want something quick, easy and full of flavour. It’s also a winner if it’s cheap to make and uses up a few bits and bobs I have hanging around in the fridge too. Keema rice is one of my guilty pleasures; I love the heavily spiced lamb, golden onions and fragrant rice. I thought it was about time I attempted to make it at home. Gently fry the cloves, cardamom and bay in a saucepan with a little oil. Add the rice and stir well to coat in the oil and spices. Pour in 500ml water and put a lid on. Bring to the boil then reduce to a simmer. Simmer for 10 minutes, check occasionally and top up with water if needed. Remove from the heat and leave to stand for five minutes; the rice should be perfectly cooked. Remove the spices. Put the onion and garlic into a large frying pan and fry for 10-15 minutes on a medium heat. Add the mushrooms to the pan and turn the heat up. Keep everything cooking until golden brown. Mix the lamb mince with the cumin, salt, pepper and garam masala. Add the lamb to the frying pan and fry until brown. Add the peas for a minute or two before adding the rice and giving everything one final mix. Serve up and top with some fresh coriander. I really liked the flavours and textures in this; the rice had a lovely fragrance from the spices it was cooked with, the peas added a sweetness, the mushrooms gave an earthy flavour and the coriander a freshness. The lamb was nicely spiced; I’d be tempted to add a little chilli powder next time for a bit of heat. Although not identical to my takeaway favourite at less than £1 a portion this will be making a regular appearance on the dinner table. In case you were wondering, I would have preferred to use frozen peas but as I now don’t have a freezer I have switched to tinned peas. They aren’t quite as green but for dishes like this or cottage pie they add a lovely texture and sweetness. I think I’m officially a tinned pea fan. 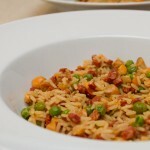 Sounds lovely and comforting rice recipe!!! Yum, this looks amazing! Thank you for the recipe! A lovely dish. Love the lamb in it as well, and the wonderful seasonings. 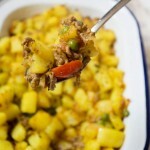 Keema dish by itself if nice and with rice – triple nice. 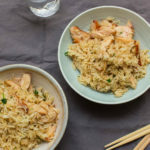 A simple and delicious rice dish! I am all about rice recipes. This looks so good! I like all of your criteria for a weeknight meal! I share them! These rice looks really terrific.